Kalpa is a small hill station town in Sutlej Valley, Kinnaur district, Himachal Pradesh, famous for its apple orchards, ancient temples and Buddhist monasteries. Kalpa Hill station Town in H.P. Most people follow both Buddhism and Hinduism and many temples have deities of both religions. The town is situated at an average altitude of 2,960 meters or 9,711 feet. Pine-nut forests, Deodars, etc, are seen in plenty here. Shivling rock, part of the Kailash mountains, which changes its colours throughout the day, can be seen from this hill station town. Shyam Saran Negi, who was the first voter to cast his vote in the 1951 general elections, belongs to Kalpa. There is a famous ancient Goddess Chanadika Devi temple at Kothi village, at 3 kilometers from Reckong Peo, the district headquarters and the downtown to Kalpa town. Kinner Kailash mountain ranges is another interesting place, a land known for its myths and fantasies. Suicide Point is another tourist spot at around 10 minutes walk from the town. Batseri village on your way-up is famous for handicrafts. The village has an ancient Lord Buddha temple and a Lord Badri Narayan temple. Sapni fort is also an important tourist destination known for its outstanding architecture. How Do I Go to Kalpa? Kalpa town can be reached from the district head quarters, Reckong Peo. Reckong Peo is at around 260 kilometers from Shimla, the state capital. Match to September are ideal months to visit this hill station town. Other months are extremely cold and should be avoided. Temples dedicated to Ambadevi, Shri Krishna and Shri Venkateshwara are the main historic temples in the Temple Town of Amravati. Ambadevi temple dedicated to Goddess Amba (Goddess of Shakti) is the most famous temple among these, situated at the heart of the city, at Gandhi Square, 1.5 kilometers from the Amravathi Bus station. It is believed that Lord Krishna ran away with Goddess Rukhamini, a day before her planned marriage with King Shishupal of Ched, from Shri Ekvira Devi Temple which is situated in the vicinity of Amba devi Temple, to a near by holy place Koundinyapur, through an underground tunnel (which still exists ; but closed for visitors). Navaratri Festival is the main festival which is celebrated with various cultural and religious programs in the temple and the city; Dandiya dance being the most famous among these cultural activities, in which nearby villagers takes part enthusiastically. Bhakti Dham Temple on Amravati – Badnera road where idols of Lord Krishna and Radha are work-shipped and Sridham Temple at Rallies Plot in the heart of the city where idols of Lord Krishna, Goddess Radha, Lord Ram and Goddess Sita, Lord Ganesh, Lord Shiva and Rani Satiji are kept, are two other famous temple in the Amravati city. Some of the other famous temples are Sai temple at Sai nagar and an ISKON temple (dedicated to Lord Krishna and his wife Shri Rukhmini devi at Rathi nagar). How Do I Go to the Ancient Temple Town of Amravati? Nagpur city, the hub for the Logistics industry in India, is at around 156 kilo meters from Amravati (Nagpur being at the center of India). 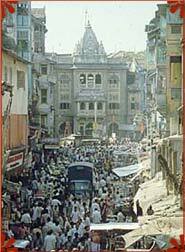 The Temple city is very close to the passes which connects the state of Maharashtra to nearby states. World famous UNESCO World Heritage site of Ajanta caves, belonging to the 2nd century BCE with Buddhist rock-cut cave monuments, are situated at around 300 kilometers distance from this ancient temple city. Amravati is close to the borders of Madhya Pradesh, Chhattisgarh and the newly formed Telungana state. NH 6, Surat – Kolkoata National Highway, passes through the holy city of Amravati. There are 3 railway stations connecting Amarvathi with the rest of India. Badnera Junction (BD) is the main station which connects the temple city of Amravathi with other cities of India. There are two other railway stations in the city. They are Amravathi (AMI), and New Amravathi (NAVI) stations. Nagpur is the nearest airport with commercial operations, even though Amravathi has a small airport which is not uses for commercial operations.